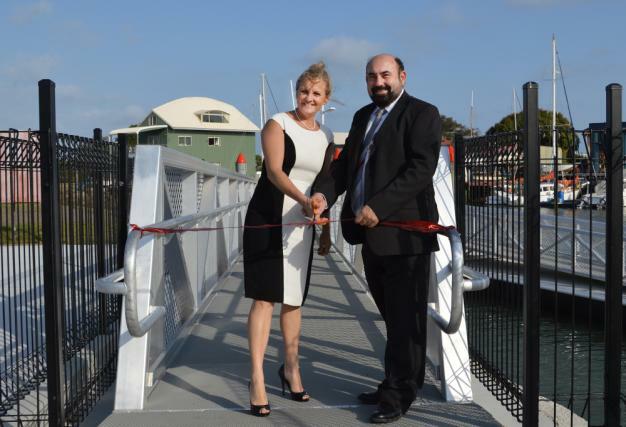 Redland City Mayor Karen Williams officially opened a new $540,000 public pontoon at Weinam Creek, Redland Bay this week. Mayor Karen Williams said Council requested funding from the State Government to prioritise this project as the existing pontoon had reached the end of its life. “The pontoon was funded by Queensland Transport Marine Infrastructure Capital and Maintenance Program,” Cr Williams said. “The old pontoon was decommissioned on 29 August 2012 with the new pontoon and gangway offering high quality design and construction. “The design meets Australian standards for public access and allows for assisted disability access. Councillor Mark Edwards said the new pontoon would be used by the community for year-round boating and water activities and would provide safer and easier access for water enthusiasts accessing Moreton Bay from Redland Bay. “The pontoon is available for use by the general public as a pick-up and drop-off point, with a maximum 20 minute stay and has a length of 27 metres connected by a 26.5 metre gangway,” Cr Edwards said.